By definition, edging plants are those you plant to provide a well-defined boarder along various features in your landscape. 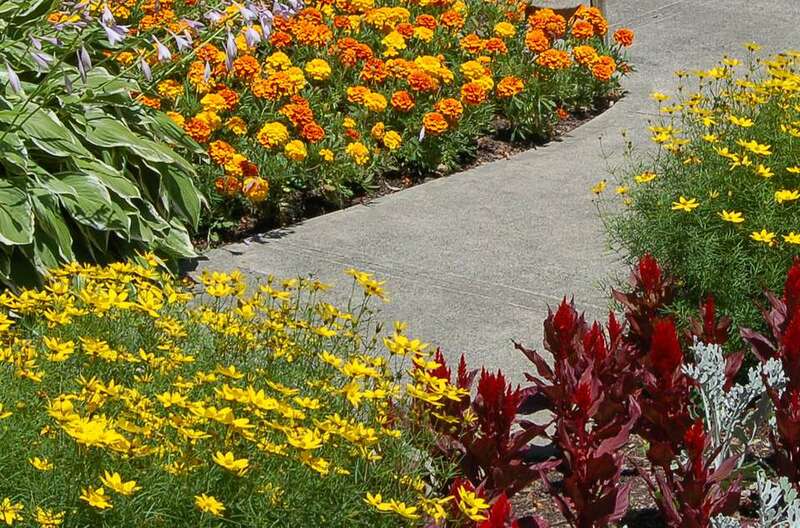 This can range from the border between your property and the neighbors, to a border along a hardscape feature of your yard, such as a driveway or sidewalk; to the plants that edge a perennial border garden. And the types of plants you use for edging can vary just as widely—from a row of tall bushes to form a privacy hedge, to a row of tiny alyssum that edges the front of a perennial flower garden. What is the purpose and usage of the space you are edging? What do you hope to accomplish? Some plants are best for merely defining visual borders, for example, while others can offer a literal physical barrier. What are the conditions of the location? Sun or shade? Dry or doggy? Secluded or high-use? Make sure to choose plants that will thrive in the conditions. Do you have broader landscape-design goals? How will your edging plants fit into that scheme? Perhaps you have a particular color scheme in mind, or are set on achieving a low-maintenance landscape). Perhaps the most important consideration when choosing edging plants is simply understanding the purpose. For example, if you have a stone path that is frequently used, you might wish to soften the hard, cold lines with edging plants, but it's also important not to interfere with its function as a walkway. The solution here is to select short plants—perhaps something with leaves and flowers close to the ground—that will "take the edge off the hardscape feature. Using a mass of plants of all one species, such as one of the many great ground covers available, will give a great visual impact here. In this example, you would also want to avoid plants that are messy, such as those that drop berries, since they could create a slippery safety hazard and a tiresome cleanup chore. Suppose, on the other hand, your purpose is to define a property border and provide privacy. Here, the goals are entirely different, and the best plants would be the exact opposite of a groundcover—a row of tall shrubs is the proper edging plant here. Although this pushes the standard definition of "edging plant," it can be said that even a row of trees planted as a wind-break is one type of edging plant—one that is planted for a very specific purpose in mind. Growing conditions have a huge impact on the edging plants you choose. For example, the hostas that might make a fine edging along a sidewalk in dense shade will not work at all in a location that bakes in the hot sun all summer long. In regions with cold winters where sidewalks are treated with salt to melt ice, the plants that edge those sidewalks must be chosen for their ​ability to tolerate alkaline, salty soils. The truth is that almost any plant can become an edging plant if it serves the intended purpose, but the classic edging plants are low-growing plants that form the lowest tier of a landscape design. Here are some examples of such plants for specific conditions. Although it is more subjective, your overall design goals should also be carefully considered when choosing edging plants. The same design elements that apply to the overall landscape also should be considered when choosing edging plants to fit into your own yard. What Are Ground Covers and Why Are They Useful?